For roofing on your home it’s usually asphalt shingle roofing. The reasons for choosing asphalt shingle roofing is simple; because it works really well and it’s affordable. 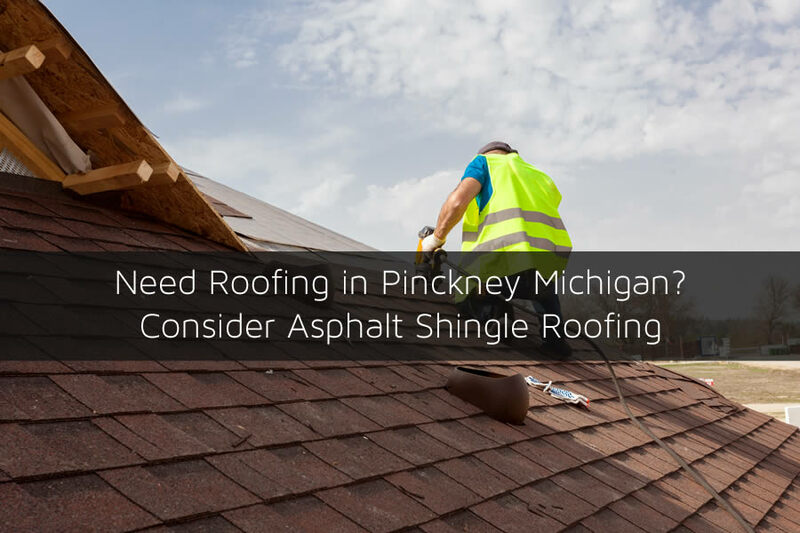 Because of this asphalt shingle roofing has been around for many decades and continues to be the number one roofing choice for home owners in Pinckney Michigan and surrounding areas. If your home currently doesn’t have asphalt shingles installed or you’re considering getting a roof replacement in Pinckney Michigan I’ll provide some tips to help you get the best roof possible for your home. As I mentioned above, asphalt shingles are the number one choice for roofing in this area. And although they have been around for many years doesn’t mean they aren’t getting better. More technology is now being placed in the construction of asphalt shingle which makes them strong and much better at protecting your home. All the while adding a touch of beauty for the home. There are many styles and colors of asphalt shingles in Pinckney Michigan that you can choose for your home to give it a great new look as well as protect your home for years to come. All the while adding a touch of beauty for the home. There are many styles and colors of asphalt shingles in Pinckney Michigan that you can choose for your home to give it a great new look as well as protect your home for years to come. Keeping your roof in tip top shape can help it last for many years and better protect your home. One of the biggest advantages of asphalt shingle roofing is the maintenance required is usually minimal compared to other roofing materials. With many different types of roofing materials there is a standard amount of maintenance required to keep the roofing’s appearance up as well as the function of the roofing. With asphalt shingle roofing in Pinckney Michigan they continue to look fresh and updated for many years after initial installation with very little maintenance and upkeep required. Asphalt shingle roofing is also easily repaired if needed when it becomes damaged from the weather elements. If it is damaged getting a roofing contractor in Pinckney Michigan such as Livingston Roof Pros to do roof repairs may be needed. There are several ways that asphalt shingles can be installed on your Pinckney Michigan home. If you currently have asphalt shingle roofing on your home, one way to install the new asphalt shingle roofing is called re-roofing. This method is basically like laying a new layer of asphalt shingles over the previous layer. Using re-roofing can cut down on the costs of replacing your roof in Pinckney Michigan however it does have a few drawbacks. Talk with a qualified roofing professional such as Livingston Roof Pros about your options when getting a new asphalt roof installed. The other method that many home owners will choose is called a complete tear off installation of a new roof. The roofing on your home is removed and a new layer of asphalt shingles are added. For homes that have metal roofing, this may be the only option available. The cost of a complete tear off is typically higher because more labor, materials, and debris removal is required. In either case, here at Livingston Roof Pros we can usually have your roof removed and then replaced on the same day. We have the roofing professionals and equipment to make sure your roof is installed quickly and professionally. Asphalt shingles are now offered in a variety of designs, colors, and textures. Any style home, no matter what type it is can be covered with asphalt shingle roofing while maintaining its true identity and beauty. Installing asphalt shingles can be added to achieve the presence of natural materials while maintaining the advantages that asphalt shingles provides. If you like the look of cedar shakes, wood, tile or slate a shingle can be created to take on the look and feel of the roofing material of your choice. This is ideal for asphalt shingle roofing that wish to appear expensive while keeping with the benefits of asphalt shingle roofing. One of the biggest advantages of using asphalt shingle roofing is that it costs much less than other types of roofing. An although it costs less, it protects the home just as well, or better than those other roofing choices. Want to learn more about asphalt shingle roofing in Pinckney Michigan? Be sure to give us a call here at Livingston Roof Pros to discuss your roof further. We can also provide a free estimate on installing a new asphalt shingle roof on your Pinckney Michigan home.